STARTING IN HIGH SCHOOL (GO CAMELS! ), RUDY DEVELOPED HIS INTEREST IN VIDEO PRODUCTION VIA HIS COMMUNICATIONS CLASS. AFTER A FEW HIGH SCHOOL PROJECTS INCLUDING ONE TO N'SYNC'S "BYE BYE BYE", RUDY JUMPED FULL IN TO VIDEO PRODUCTION AND HAS BEEN WORKING FOR 13 YEARS. BESIDES VIDEO PRODUCTION AND PHOTOGRAPHY, RUDY LOVES PLAYING GOLF, DRINKING COFFEE, USING OLD FILM CAMERAS, COOKING, ALE 8/GINGER ALE/MULES, AND RELAXING WITH HIS WIFE ON THEIR PORCH. TAMMI GRADUATED WITH A PHOTOGRAPHY DEGREE IN 2010 AND HAS BEEN PHOTOGRAPHING PROFESSIONALLY EVER SINCE. SHE HAS BECOME A FANTASTIC PHOTOGRAPHER AND HAS RECENTLY STARTED A NEW INITIATIVE ON HER OWN, PHOTO PUP PHOTOGRAPHY WHERE SHE COMBINES HER LOVE FOR PHOTOGRAPHY AND LOVE FOR ANIMALS. ASIDE FROM WORK, TAMMI HAS SEVERAL INTERESTS RANGING FROM TRAVEL, CROSS STITCH, BAKING, TO BIKE RIDING. BUT NOT MANY THINGS CAN COMPARE TO HER LOVE FOR HER CURRENT PETS HANK AND TED, A 1.5 YEAR OLD BOYKIN SPANIEL AND A 5 MONTH OLD KITTEN RESPECTIVELY. AFTER A JOB TRANSITION LED JENNY AND HER HUSBAND TO CINCINNATI FROM DENVER, JENNY HAS MADE HER MARK ON THE CINCINNATI PRODUCTION SCENE. WORKING A COUPLE OF DIFFERENT JOBS WITHIN PRODUCTION, JENNY EVENTUALLY FOUND HER WAY TO HARRIS MEDIA CO AND WE COULDN'T BE HAPPIER SHE DID. HAVING AN EXPERTISE IN PRODUCING BUT ALSO MANY TALENTS WITH PHOTOGRAPHY AND CAMERA OPERATION, JENNY IS A WELCOME ASSET TO OUR TEAM. OUTSIDE OF WORK JENNY ENJOYS FINDING REALLY GOOD RESTAURANTS, PHOTOGRAPHY, LAUGHING, AND SNUGGLING WITH HER TWO DOGS BRUFF AND BAILEY. 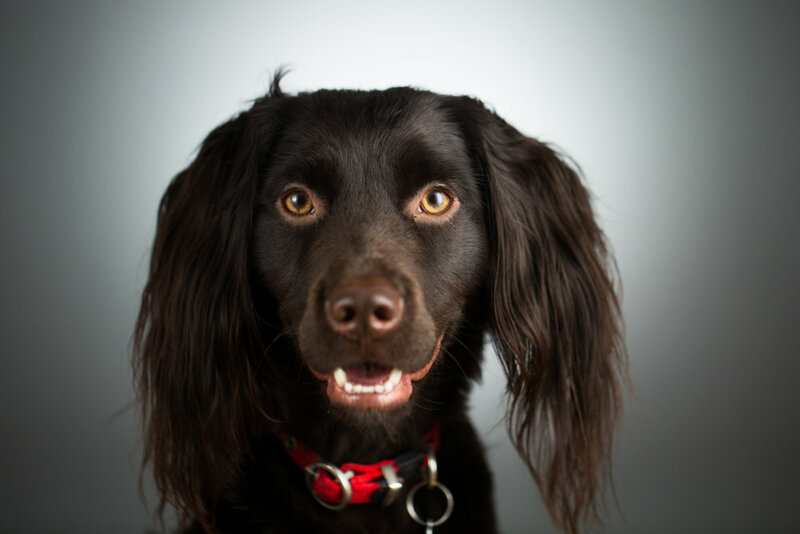 HANK IS A 1.5 YEAR OLD BOYKIN SPANIEL WHO IS VERY CONFIDENT IN HIS POSITION AND LOOKS. IF YOU ASK HANK, IT MAY JUST BE HIS FAVORITE THING. THOUGH HE DOES RUN A PRETTY TIGHT SHIP, BARKING AT ANYTHING THAT HE DEEMS A THREAT TO HIS MOMMY, HANK IS QUICK TO GAIN TRUST AND WILL BECOME YOUR BEST FRIEND IN NO TIME. OUTSIDE OF WORK HE LOVES NAPS, WRESTLING HIS CAT BROTHER TED, TREATS, NAPS, REALLY GOOD WET FOOD, NAPS, BARKING AT EVERYTHING, AND NAPS.